This guide will explain how to add and configure IRC networks with the Burd IRC client. It will also explain how to add a ZNC connection. Open Burd IRC and click the New button in the bottom left corner. Then click the text that says “Create a new network…” Then a tab should appear that looks like this. Most of the information here is simple and I do not need to explain. Such as nick name, alt. nick, user name (your IRC ident), and real name. Next enter the information/connection information for the IRC network you would like to connect to. Such as the network name, host, port, etc. Most of this information is pretty simple and I will not explain it. 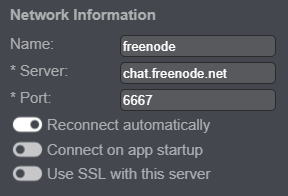 You MUST check off Use SSL with this server if you want to use SSL to connect to IRC. This section is where you setup NickServ, SASL, server password, or no authentication. Check off the None option to not use any authentication or login methods. 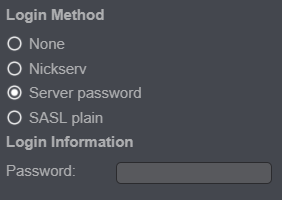 To just use ordinary NickServ authentication check off the NickServ option and then type in your NickServ password in the Password box. 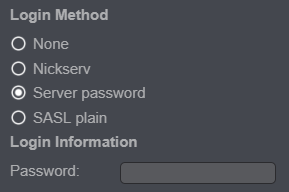 To connect to a passworded IRC network check off the Server Password option and type in the network’s password in the Password box. To identify to NickServ via SASL authentication check off the SASL Plain option. Then enter an username to identify to in the User box. Then for the password box enter your NickServ password. You can enter on-connect commands such as JOIN #examplechannel so that is will perform the commands specified on connect without you having to manually type it in after connected to the IRC network. You can enter one or more connect commands by separating the commands with commas. Escaped commas are also accepted. Then click save and you are finished! This section will explain how to add a ZNC connection to Burd IRC so you can use Burd IRC and ZNC. If you need ZNC related help we suggest you visit the ZNC Wiki. Or visit #znc on the Freenode IRC network. Burd IRC is not responsible for any ZNC issues you may have. Start by going and opening up the add network page. What you enter for the user information when on the new network page doesn’t matter. (nick, alt nick, etc) You can type anything in and it will not affect your ZNC connection. The next step is to enter the network connection information. The network name option when adding a network is not required. But it is extremely helpful for people who use ZNC and have many networks. It will display the name you supplied when adding the network in the list of connections. The server hostname will be the IP adress or hostname of the server ZNC is running on. Now enter the port for which ZNC is listening on. 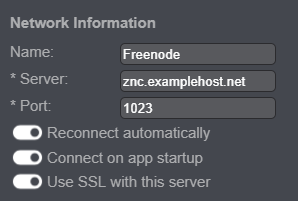 Now check off options such as automatically reconnect, connnect on startup, and if Burd should use SSL to connect to the ZNC. Remember, you MUST check off Use SSL with this server if the port you supplied is an SSL port. 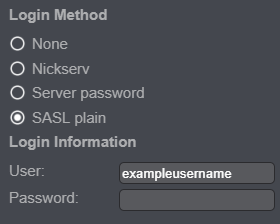 The login method you need to use to connect to a ZNC using Burd is the Server password method. 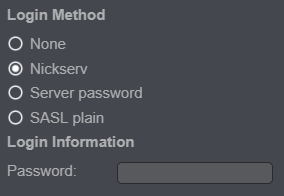 Start by selecting Server password as your login method. Then a box to enter your password in will come up under Login Information. ZNC Username - The username you would use to login to ZNC and the ZNC webadmin. ZNC Password - The password you would use to login to ZNC and the ZNC webadmin. Once you have entered all the information required, just save the network and connect to it. 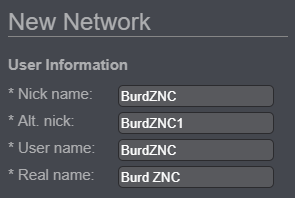 And now you are using a ZNC connection with the Burd IRC client!